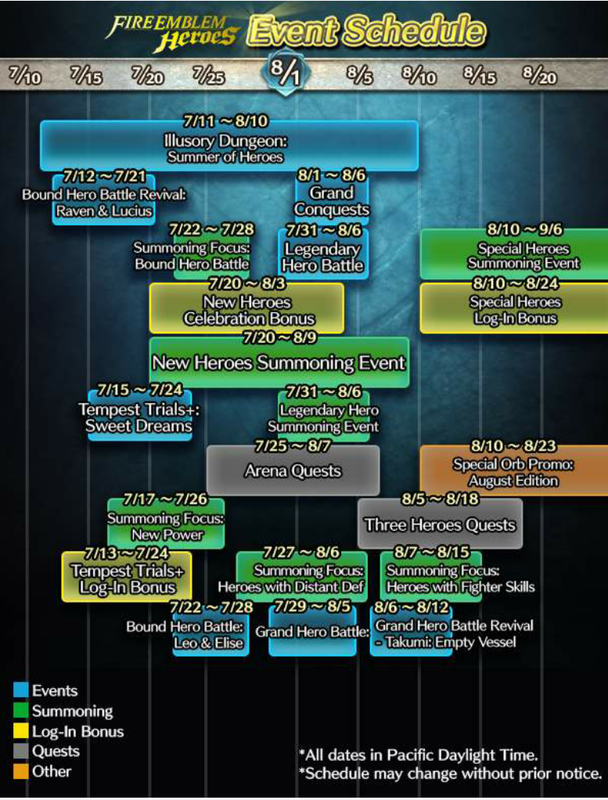 Heroes: July & August Event Calendar + New Tap Battle! As the previous event calendar winds down in Fire Emblem Heroes, a new one has arrived! Check it out to see what’s coming in the next month! According to the calendar, we have quite a few events beginning soon. The next Tempest Trials+ is slated to begin 15 July, with a New Heroes summoning event occurring 20 July. 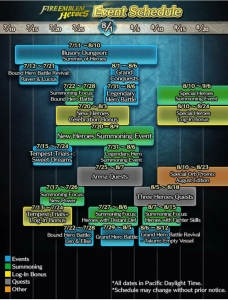 In addition, we have a new Grand Hero Battle beginning 29 July and the next Grand Conquests is scheduled for 1 August. A full list of the events can also be found below. Furthermore, the next Tap Battle has begun! Tap Battle: Illusory Dungeon – Summer of Heroes can be found in the Event menu. Aside from the usual stages to complete, a variety of Daily Quests are available, with more to be added later. Summer of Heroes Tap Battle will last a month, ending on 10 August. Feh Channel Chills Out: What’s Coming to Heroes? It’s been a pretty exciting buildup to wait for the first Feh Channel livestream of the year, and if you missed it, you missed a lot! For starters, we’re greeted by our adorable Feh, as we’re introduced to a cake made especially for Feh’s first birthday (January 18) by the Heroes development team. She’s quite excited. Pay close attention to the macarons on top of the cake, as they’re today’s Orbs for news.